This book looks at the behavior of individuals at risk, insurance industry decision makers, and policy makers at the local, state, and federal level involved in the selling, buying, and regulating of insurance. It compares their actions to those predicted by benchmark models of choice derived from classical economic theory. Where actual choices stray from predictions, the behavior is considered to be anomalous. 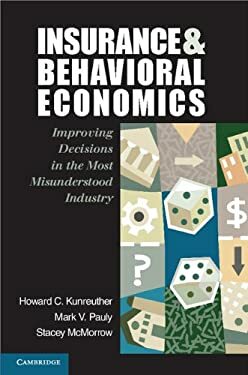 Howard C. Kunreuther, Mark Pauly, and Stacey McMorrow attempt to understand why these anomalies sometimes occur and sometimes do not, in many cases using insights from behavioral economics. The authors then consider if and how such behavioral anomalies could be modified to improve individual and social welfare. This book is in no way a defense of the insurance industry nor an attack on it. Neither is it a consumer guide to purchasing insurance, although the authors believe that consumers will benefit from the insights it contains. Rather, this book describes situations in which both public policy and the insurance industry's collective posture need to change. This may require incentives, rules, and institutions to help reduce both inefficient and anomalous behavior, thereby encouraging behavior that will improve individual and social welfare.